One of the points of this project is to not portray yourself as perfect. Life isn’t perfect and one of your goals when taking photos should be showing your life. And when you share an imperfect moment in your life with your photos you suddenly become more real to your audience. Today has been a day of fun and frustrations. Laying in bed this morning I realized that I was supposed to take some files over to the church for printing and then looked outside to see the rain and realize my husband has the car. I started working on making some table number card holders for an event I’m helping with at the church to realize I was out of salt and cream of tarter halfway through the project. So I decided we will make this fun! I bundled the boys in their new rain gear and we went to the church, went to the store, and went and had a pizza date! I got home fought with the card holder project till I was completely exasperated at making a mess and with nothing to show for it. Have to love when I project doesn’t turn out how you want. I then sat down to relax realized that Lynda had sent me the linky for Project 52 and I hadn’t found a good time to take a shot. Sigh. Then I knew what I would do. I pulled out the camera and showed off my imperfections. 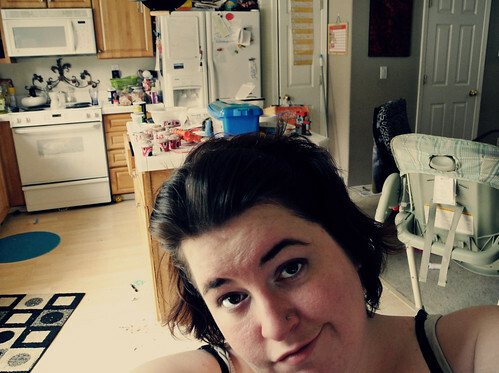 Showing off my messy kitchen with the sad results of a bad end to a project. Sharing myself with makeup rinsed off with rain, hair that needs a haircut. And lastly giving you a smirk to show you I’m not always in the perfect mood. Lynda (from Daily Window) and I are putting up a new linky every Monday and inviting you to participate in this project with us. I hope you will join us! This month we are taking a break from themes, so just pull out your camera and start snapping your photo!! You are so totally cute in this photo. I love it! I’m not sure I’m courageous enough to show off the mess in my house, though we do frequently have boxes of duplos on our counter! LOL yes we are having a lego party for the boys this Saturday so we have just got back from the lego store, so Zane has been lego obsessed. cut off in this photo is the pile of party stuff that I still have to work on after setting everything up for the event tomorrow, doing #commenthour, and working. It’s a hectic week! I love this. I love to see that I’m normal, and my messes are normal, and my bad days are normal. Awesome!